Found by Michael Fallone at Milton Ironworks during demolition. This works was founded in about 1856 by McDowall & Co, iron-founders. This firm developed a very extensive business in architectural castings, and the works eventually covered an large area. This works made many pillar boxes for the Post Office, and also telephone boxes. The firm, by then McDowall, Steven & Co Ltd, had a London office in 1901. By 1968 the buildings were in multiple occupation, and part of the complex was demolished in that year. J & M Craig, Perceton Fireclay Works, Dreghorn, Ayrshire. Found by Dan McVey on the Isle of Coll, West Scotland. This is not in my possession. J & M Craig, Dean Brick Works, Ayrshire. . . . 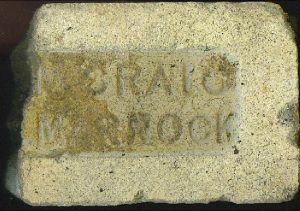 This brick is in the possession of the Rottnest Island Museum. Many thanks to Wendy Bradshaw for the photograph. J & M Craig, Perceton Fire Clay Works Kilmarnock. 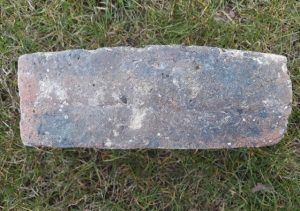 . . . .
Found by Chris Merritt at the site of the Huron Copper Mines, Upper Peninsula, Michigan. 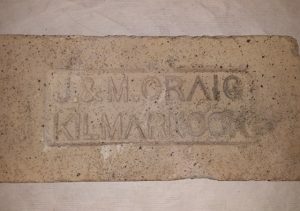 J & M Craig, Perceton Fire Clay Works Kilmarnock. . . . .
Messrs Barclay, Craig & Co, Kilmarnock. 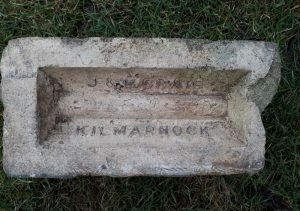 Messrs Barclay, Craig & Co, Kilmarnock were involved in the building of the Lonsdale Hermatite Iron Works near Whitehaven, England and also an on site brick works. 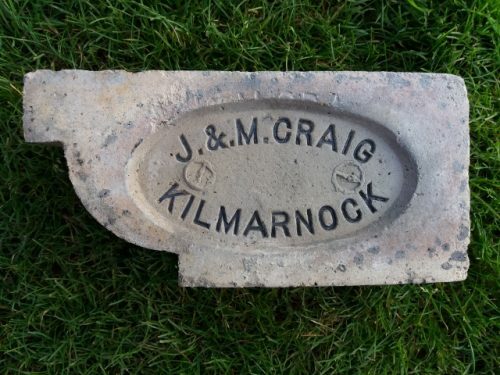 Craig & Co appear to be J & M Craig, Fire Clay Manufacturers, Hillhead, Perceton and Dean Works, Kilmarnock and Barclay appears to be James Wilson Barclay, engineer, Kilmarnock…. 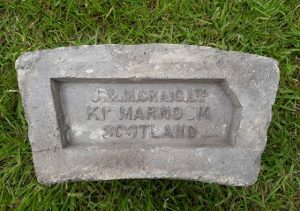 Allan and Mann bricks used to build a gatehouse at Waternish, Isle of Skye. 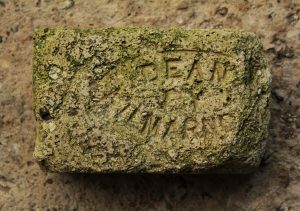 Found by Jeannie Cooper next to one of the broken piers. Maker unknown. 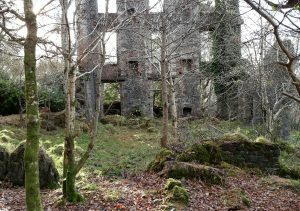 Find location would suggest Scottish origins but……. 27/05/1871 – Dundee Peoples Journal – It is understood that the contractors for the Tay Bridge have arranged for obtaining a large quantity of bricks from Messrs Robert Small & Co, brick and tile manufacturers, Dundee….